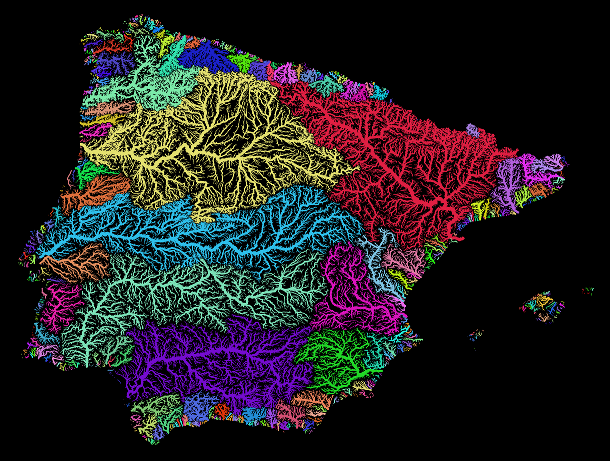 Catchments of the Iberian Peninsula. This may be an appropriate regionalization for ecological studies and resource management. In fact, it will be very appropriate to have an Iberian Environmental Agency! We used a catchment-based approach in a study of fire regimes . Other current approaches for regionalization include the one based of the movement of people instead of the movement of water (e.g., for USA, ). In any case, this is a nice colourful image of Iberia! Dash Nelson, G. & Rae, A. (2016) An economic geography of the United States: from commutes to megaregions. PLOS ONE, 11, e0166083.